For a spell Swedish, then German (and known as Stettin) and only since 1945 Polish, Szczecin is distant from the hubs of Polish power. Its shipyard workers played a key role in the Solidarity movement of the nineteen-eighties. But the city feels its distance from Warsaw, and civic leaders in Szczecin argue that Polish regional policy has not been supportive enough of a city that has been through a tough time economically. hidden europe 33 is published on 15 March. It features Europe's longest urban bus route, a spirited orbit through the suburbs of Birmingham. We invite you to join us on the front seat of the top deck for a kaleidoscopic journey through England's second city. Elsewhere in that same issue, we travel through Serbia and Bosnia by train and reflect on the enduring appeal of frontiers that no longer mark any great political divide (such as the border that once separated the two German states). We have news from Norway's far north, report from a Danish island and make an unscheduled stop in Madeira's junior sibling Porto Santo. And much more besides. You can see the full table of contents for this latest issue of hidden europe and purchase hidden europe 33 in our online shop. There is probably an extraordinary tale about quite how Anita Agnihotri ended up living in Szczecin, the Baltic port city in north-west Poland. The former Miss India and sister of veteran Bollywood actress Rati Agnihotri has made her mark on Poland's culinary landscape with the Indian restaurant that she runs in Szczecin. When to comes to eating away from home, we have usually abided by the precept "When in Rome…" - so when we had a spell in Szczecin recently, we were expecting an abundance of pierogi. That was until we realised that the Szczecin locals have wider horizons. Anita's rogan josh is evidently a big hit in Szczecin. That Poland's premier Indian restaurant is not in Warsaw but in Szczecin speaks volumes about both cities. Szczecin's port status means that the city has always had an eye on the wider world. There was an age when the city's shipyards built some of the world's finest and fastest passenger liners. And the transition to a market economy in the early nineties brought a big boost to the shipyard complex that was Szczecin's principal employer. No longer, though. The cranes stand idle, the order book is empty and the only bright light on the horizon is a Russian car and truck company that talks of building a vehicle assembly plant in the empty shipyards. 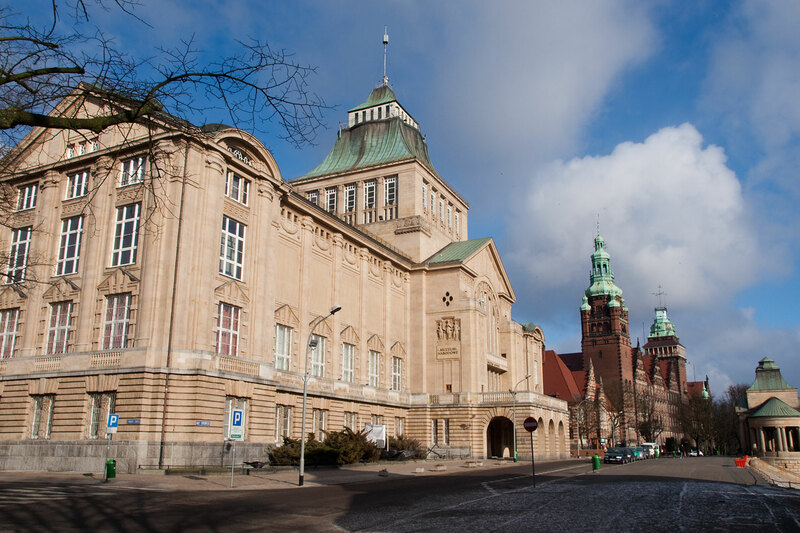 Szczecin is edgy and gritty, but all the more interesting for that. Expect none of smooth veneer of Kraków or Poznan. You can read more about this engaging city in hidden europe 33.